If you’ve ever suffered with tailbone pain you’ll know how uncomfortable and sore it can be when sitting. Tailbone pain can be caused by trauma, certain medical conditions and sitting for extended periods of time. Surgery, manipulation and medication may help with the condition and you can use a pillow for tailbone pain. Even if you’ve had medical treatment for tailbone pain many doctors will recommend that you use a coccyx cushion or pillow. Reducing the pressure that’s put on the tailbone is an effective way to ease pain and discomfort. As someone who spends many hours sitting at a desk working on a computer I use a pillow on my office chair to prevent tailbone pain. The cushion definitely makes working more comfortable and luckily I’ve never suffered from tailbone pain. The cushions aren’t expensive and they’re a simple way to prevent damage to the coccyx. Ergonomically designed memory foam seat cushion. Memory foam and gel coccyx cushion. Memory foam with rubber grip. Who Needs to Use a Pillow for Tailbone Pain? Anyone can use a pillow for tailbone pain and they’re particularly useful for people who sit down for long periods. Office workers and drivers often suffer from tailbone pain and using a pillow is a good option. The great thing about the pillows is they’re portable and can be used on most types of seat. You can also use a pillow to prevent tailbone pain from developing in the first place. If you do have to spend long periods sitting for any reason it’s worth using a decent pillow. As well as protecting your tailbone you’ll also have a more comfortable surface to sit on. You can also use a pillow if you’ve damaged your coccyx due to injury or following a surgical procedure. The pillow will protect the damaged area until you’ve fully recovered and pain levels have reduced. Using a pillow during your period of recovery may also help to prevent painful pressure sores developing. How Does a Pillow for Tailbone Pain Work? A tailbone pillow is designed to reduce the amount of pressure that’s put on the coccyx when you’re sitting. Most of the pillows have a section that’s cut out which allows the tailbone to float and not touch the seat. When the tailbone isn’t in contact with the seat you’ll be more comfortable and pain levels should be reduced. The gel or memory foam in the pillows takes your bodyweight and moulds to the contours of your bottom. Because the pillows are quite firm they also provide some support when sitting. Getting the correct level of support and comfort means you won’t move around on the seat which can damage the tailbone. A tailbone pillow can also help to correct posture which is very important when you’re sitting for long periods. 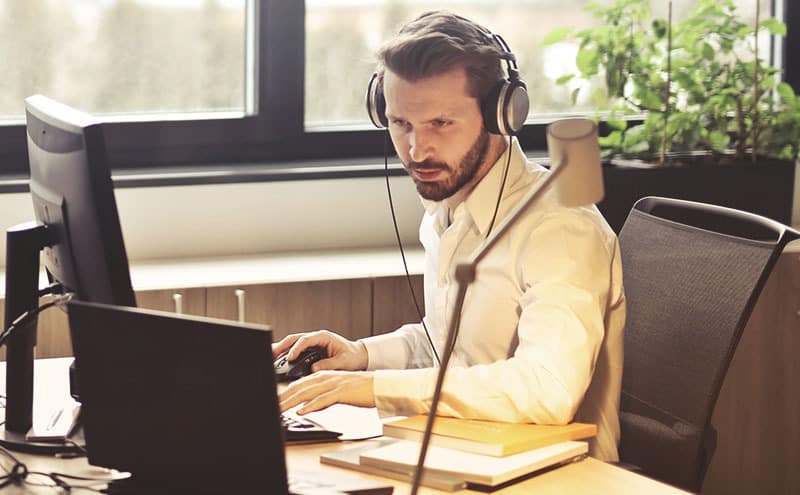 Poor posture due to slouching in a chair can lead to neck, back and hip problems. Many of the tailbone pillows are designed to keep you sitting upright and in the correct seating position. How do I Choose a Pillow for Tailbone Pain? It’s important to choose a tailbone pillow that’s of a suitable size to fit you and the seat that it’s going to be placed on. If your pillow is too small it’s not going to be comfortable and it may move around. A tailbone pillow that’s too big may not give you the support you need and it may also curl up in some seats. As well as checking the size of your pillow it’s important to check the thickness of it. If you sit on a seat pillow that’s too thick your feet may not touch the floor which will be uncomfortable. If your feet are dangling whilst you’re sitting it could cause numbness in the legs and feet. Choose a tailbone pillow that’s made from good-quality materials so that it’s functional and durable. It’s important that the tailbone pillow is soft and comfortable without compressing too much. If the foam or gel compresses, the pillow may be uncomfortable and pressure may be put on the tailbone. It’s also important to check the quality of the stitching along the seams of the tailbone pillow. If the stitching comes undone the foam or gel could leak and the pillow won’t be effective. If your tailbone pillow has a cover you should also check the stitching along the seams and the zipper. Buy a tailbone pillow that has a non-slip base so it doesn’t slide and move around when you’re sitting on it. Many of the tailbone pillows have some kind of grip on the base which is useful. If your tailbone pillow moves around you’ll have to keep adjusting it to stay comfortable. Look for a tailbone pillow that has a decent cover which can be washed by hand or cleaned in a washing machine. When you’re sitting on a tailbone pillow for long periods you are going to sweat. Keeping the pillow clean will extend its life and it’s also going to be more hygienic. It’s worth noting that you may have to try a few different pillows before you find one that suits you. Bodyweight, height and build should all be taken into account when choosing a suitable pillow. People come in different shapes and sizes and a pillow that works for one person may be unsuitable for another. Buy a pillow of the correct size. Check the thickness of the pillow. Choose a pillow that’s well made. Buy a pillow that doesn’t compress too much. Choose a pillow that’s easy to keep clean. Use a pillow with a non-slip base. What is the Best Pillow for Tailbone Pain? We looked at a range of pillows that can be used on various types of seat to alleviate tailbone pain. The main points we’ve looked at are quality, price, materials and the comfort of each tailbone pillow. We’ve reviewed five tailbone pillows and have listed some pros and cons for each product. 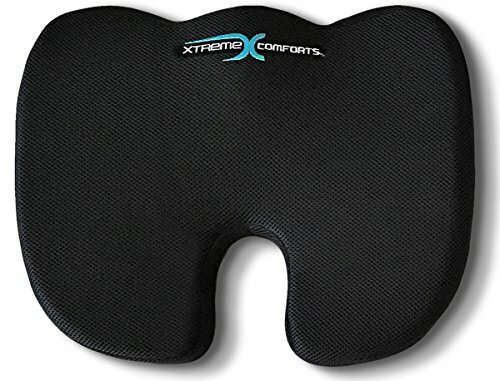 The coccyx orthopedic memory foam seat cushion made by Xtreme Comforts has a cut out to relieve pressure on the tailbone. The memory foam keeps its shape so that the cushion doesn’t go flat. This tailbone pillow also has a non-slip base and a removable mesh cover that can be machine washed. Customers who use this tailbone pillow say that some of their pain is alleviated when sitting on the cushion. People were impressed with the quality of the materials used to make the pillow and said that its durable. Customers also like the fact that this tailbone pillow doesn’t compress when sitting on it for long periods of time. Customers who purchased this tailbone pillow said it was too thick and very firm to sit on. A few customers said that after sitting on the cushion for a period of time the backs of their thighs went numb. A number of people said that this tailbone pillow is uncomfortable when they sit on it for long periods. The Kieba coccyx seat cushion is made from a combination of memory foam and gel and it has a cut out to accommodate the tailbone. The layers of gel provide a comfortable surface to sit on and the cushion has a non-slip bottom. This tailbone pillow comes with a velour cover that’s easy to keep clean by machine or hand washing. Customers who purchased this tailbone pillow said it helped to alleviate their pain and it’s comfortable. Customers also said that the cushion keeps its shape and doesn’t flatten unlike other pillows they’d tried. People also liked that fact that the cover is easy to clean and it doesn’t shrink after machine washing. Some people who used this tailbone pillow said that it’s too firm and they can’t sit on it for long periods of time. A few customers said that the zipper on the cover had broken when they tried to remove it to wash. A couple of people also said that the cushion had cut off the blood circulation in their legs. This U-shaped coccyx seat cushion made by Berrycom is designed to relieve pressure on the tailbone. The pillow is made from pure memory foam to provide adequate comfort and support. 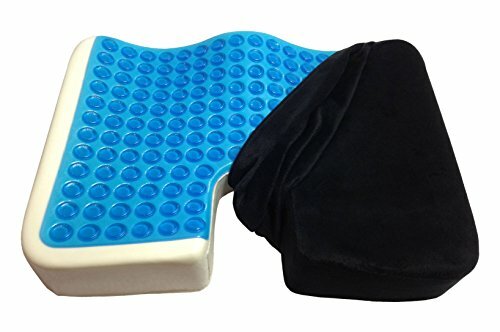 This tailbone pillow is protected by a breathable velour cover that can be hand or machine washed. Customers who used this cushion claimed it’s effective and takes some pressure of their tailbone. People also said that the tailbone pillow is well made and much better than other cushions they have used in the past. 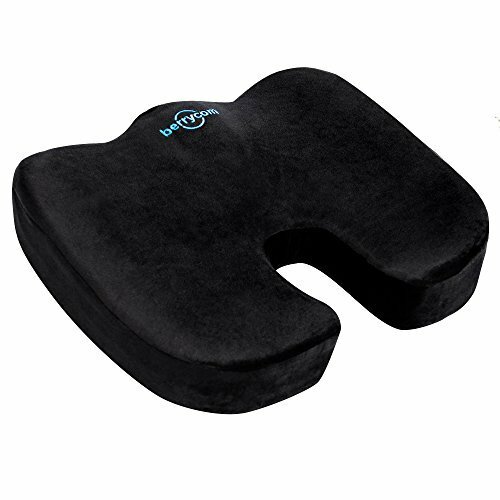 Other customers thought that this tailbone pillow helps to correct their posture when sitting. Some customers who purchased this tailbone pillow said it moved around in the seat and they would’ve liked it to be a little bigger. The memory foam was not good and the cushion compressed too much, according to other users. And finally, some customers reported this tailbone pillow didn’t give them the support they needed. 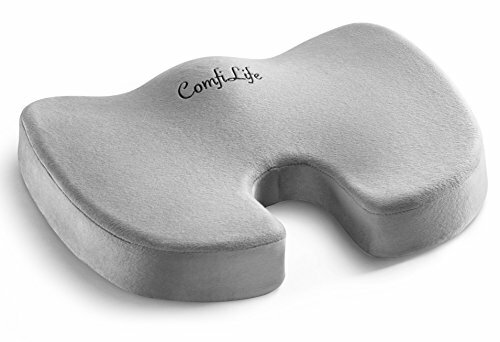 The ComfiLife premium comfort seat cushion is U-shaped and designed to support and relieve tailbone pressure. The tailbone pillow is made from high-density memory foam for maximum comfort and support. The cushion has a non-slip base and the protective velour cover can be easily removed and machine washed. 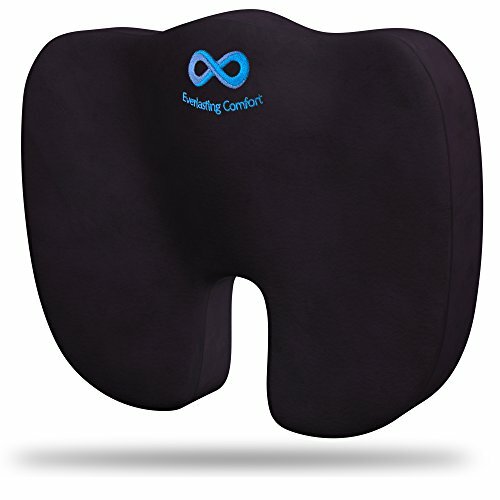 People who purchased this tailbone pillow liked the thickness of it and said it gave them adequate support when sitting. A number of customers said that the cushion stays in place due to the level of grip. People also said that the cushion alleviated some of their tailbone pain as well as improving their posture. Customers who used this tailbone pillow said it’s too firm which makes it uncomfortable to sit on for long periods. Others said that they would’ve liked the cut out area to be slightly larger, and some also said they expected this tailbone pillow to be better made for the price paid. The pure memory foam luxury seat cushion made by Everlasting Comfort responds to body heat and molds to fit. The cushion has a cut out to alleviate tailbone pressure and the base of the pillow has a rubber grip. The tailbone pillow is protected with a zip-up cover that can be machine washed. People who used this tailbone pillow were impressed with the rubber on the base and reported it keeps the cushion in place. Customers said that the memory foam is good and the tailbone pillow kept its shape. Customers also said that the tailbone pillow is supportive and it reduced their pain levels. Other customers who purchased this tailbone pillow said that the stitching is poor and the seams on their pillow split. A few customers said that the tailbone pillow has an unpleasant odour when it’s new. Some people also said that this tailbone pillow is very hard and it makes their lower back ache. All of the tailbone pillows that we’ve looked at are supportive and should relieve tailbone pressure and make you more comfortable when seated. They’re all U-shaped and made from similar types of material, along with being similarly priced and they’re all very easy to keep clean. After carefully comparing all of the products the best pillow for tailbone pain is the Xtreme Comforts Coccyx Orthopedic Memory Foam Seat Cushion. This tailbone pillow is good value for money and the high-quality memory foam provides a firm level of support. The pillow doesn’t compress too much and it alleviates tailbone pain effectively. We also like the level of grip on the bottom of the tailbone pillow and the machine-washable cover.